With another year of the Super Bowl behind us and baseball season starting, our thoughts have been on all of the preparation and work that is required to get to the end of a sports season. A parallel could be made with the graduate school application process. Many students, who completed the grueling application process and gleefully received their acceptance notifications, might be tempted to take a well-deserved rest for having accomplished a long sought-after goal. However, we would like to suggest that gaining admission to graduate school is similar to making it to the championship game in sports. The achievement is a significant one, but there is still work to be done in order to move that success to the next level. In other words, do not think of the season as over just yet. The following is some advice that applies to teams during that final stretch of training, as well as to students who are transitioning between being an undergraduate to a graduate student. 1. Continue Training and Preparing. Gaining admission to graduate training is a significant achievement. In the process of celebrating, visualize the next goal ahead of you. Athletes do not stop training simply because they have made it to the play-offs. In fact, this time is often characterized by increased motivation and effort. The team that awaits athletes in the next round of play will be the best yet, and in the same manner, new graduate students will move into an arena with some of the best and brightest students and faculty in their field. During the final undergraduate semester and the summer, students can prepare themselves to hit the ground running once they arrive at graduate school. If possible, start or continue conducting research and collecting data. Research experience is always valued by and contributes to success in graduate programs (Alvarez, 2013; Grover, 2006; Koch, 2008). Better yet, bringing data to your graduate program allows you to submit your work to the next professional conference that you plan to attend. Mentors will appreciate seeing that initiative. Investigate outlets in order to convert current data sets into publications. A range of journals exist, and it is likely that you can find one that matches your data. Every publication does not have to be in the most prestigious journal. There is value in simply experiencing the process of publishing and having a tangible product for your curriculum vitae. Seek out opportunities during your last semester and summer before graduate school. For example, if teaching is part of your graduate funding, ask if you can assist one of your current teachers in some way. If you will be working with specific laboratory equipment, find a way to be trained on that equipment. • Start thinking about your personal budget in light of your next step and then prioritize. You may find that you need professional clothing for teaching assistantships, academic presentations, or conference attendance. As a graduate student, you may choose to invest in reference materials, professional memberships, or travel that is not directly covered by graduate funding. Although your final grade point average will be calculated after graduate admissions are decided, stay focused. Your goal should be to learn, instead of thinking that your job of earning good grades has ended. The first reason is that the information you learn during your last semester may one day improve your graduate school research or a class you are asked to teach. Second, the most successful professionals consider themselves lifelong students, and you should also work to adopt this self-identification as you evolve into a young professional. Practice the way you want to play. Practice does not make perfect. Perfect practice makes perfect. 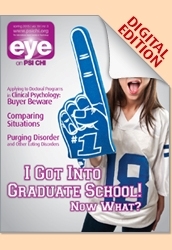 Do not wait until you are physically at your graduate program to begin “acting” professionally. We surveyed undergraduates and asked them about their current behaviors and the way they planned to behave in their careers. Students who reported poor behavioral habits such as tardiness and dishonesty had powerful intentions to make drastic changes following graduation (Ritzer & Sleigh, 2004). The concern is that change is not easy, especially when behaviors have been ingrained. To be a successful graduate student, start the process early by adopting good habits and making them second nature. 2. Get Ready to Play in a New Environment. Just as athletes may have to adjust to a new time zone, climate, or altitude for the championship game, graduate students will have to adjust to a new playing field. Many students may find themselves transitioning from an environment of comfort and success to one that is relatively unknown and perhaps a bit intimidating. Athletic teams often manage this change by familiarizing themselves with the new environment prior to having to perform in it. Incoming graduate students can adopt the same strategy by giving themselves time to mentally and physically acclimate to their new context. Start envisioning yourself as more than a “college student.” Although being a student will continue to be an element of your identity, you should also envision your new roles. Graduate students will be part of a cohort of peers, and those group dynamics, be they cooperative or competitive, will powerfully influence graduate training. Graduate students also will be supervised by others and may simultaneously be in a position to supervise. Graduate students will develop multifaceted relationships with their mentors, gradually moving from being learners to creators of knowledge. Taking the time to honestly evaluate strengths, weaknesses, and goals is the first step toward becoming the person you plan to be. Be realistic about the acclimation period. Some students find it especially challenging to leave a realm where they have excelled to enter an unknown situation. If you expect to repeat your undergraduate experiences, you may find yourself disappointed. Instead, be open to the growth that occurs when you get pushed out of your comfort zone and have the chance to prove yourself in new ways. 3. Focus on Being a Team Player. The best teams are comprised of players who focus on team success rather than just individual success. Future graduate students need to have the same mentality. Graduate school classes will consist of some of the best and brightest students from around the country. There may be a temptation to see these peers as competition for faculty attention or other resources. However, viewing the graduate school cohort as a team increases the chance for each member to succeed. Decide in advance how you will choose to interact with your classmates and peers. If you think of them as competitors, you may create a self-fulfilling prophecy. If you think of them as collaborators, you are likely to develop lifelong friends and colleagues in the coming years. The reality is that the habits that you develop as a graduate student will follow you into the workplace. Practice patience, tolerance, and gratitude. These characteristics will help you appreciate the people that surround you at all stages of your career. When you have a positive local environment, you are in a better position to weather storms that may arise in the global environment such as university-level personnel or policy changes. Consider writing a short note to faculty, staff, and other students with whom you interacted during the application process to express your excitement about joining the program and working with them in the future. Keep these contacts short because you do not want to be seen as needy. 4. Be Prepared to Learn From New Coaches. As athletes move to new levels of performance, they have the opportunity to learn from new coaches. These coaches might be hired to push athletes beyond what they think is possible or to help athletes bring their mental game into alignment with their physical abilities. These coaches might address an overlooked weakness or advance an existing skill. In all cases, the goal is to improve the athlete, even when the process feels uncomfortable. In the same way, graduate students open themselves to a world of new coaches in the form of faculty members and more experienced graduate students. When the goal is self-improvement, the wise graduate student will accept useful advice and constructive feedback regardless of the source. Process can be just as important as products. An extensive body of research indicates that finding a mentor is a key to success in graduate school (Burns, 2012; Spivey-Mooring & Apprey, 2014). For example, mentors can positively impact retention and job placement of graduate students (Moak & Walker, 2014). Data collected from graduate students also suggests that mentoring relationships are not accidental and effortless; students may have to initiate and work to maintain them (Cox, Cullen, & Buskist, 2008). Take the time to look for faculty members with whom you connect, and then find ways to build relationships. Do not limit yourself to one person but instead develop multiple relationships in the hopes that one will become a close mentorship. Not all advice is useful and not all feedback is constructive. Be open to hearing from others, while at the same time striving for discernment. If someone does not have your best interest at heart, consider their words in that context; good advice can come from bad people, but it is less likely. When someone is genuinely working on your behalf, allow their perspective to carry weight. Be willing to temporarily see yourself through others’ eyes in order to evaluate whether that is the image you want to project as a graduate student and young professional. Do not make the mistake of thinking that only those in positions above, or parallel to, you can coach you. Treat everyone with respect and recognize them as potential teachers. For example, staff members often have a unique perspective in an academic department and can help a receptive student navigate the landscape. Students, whether you teach them in the classroom or supervise them in a laboratory, also see the world from a different angle. Students may enhance your efforts by providing fresh ideas, creative solutions, or relevant examples. Most exciting, graduate students can develop their own mentoring skills by investing in undergraduates. Be receptive to coaching and training from all directions. Do not try to recreate former mentoring relationships from your undergraduate years with different faces. Be receptive to the individuality and personality quirks of your new teammates. The professor who seems intimidating or standoffish at first may have a significant impact on your life. You do not want to miss a meaningful relationship because of limited information or misunderstood impressions. Finding methods to communicate and connect with others will likely have benefits that extend far beyond graduate school as you work with a variety of clients, colleagues, and supervisors. 5. Do Not Forget Your Old Coaches. The wise athlete who is open to learning from new coaches is also smart enough to appreciate the former ones. Although it might temporarily help televisions ratings, there is a discomfort associated with watching a player speak poorly of former coaches or teammates. In many sports leagues, players can potentially find themselves returning to that same team or missing a chance for an open spot on that team in a later season. Because the future is unknown, burning bridges is never a good idea. This principle also holds for undergraduate students with graduate school in their sights. Psychology can feel like a small world. Faces from the past often reappear, and people’s paths intersect in unexpected ways. Thus, old connections may not stay old forever. Like the wise athlete, the wise student values people from their past. As you move forward, show appreciation to those you leave behind. You deserve credit for your accomplishments, but they occurred in a context, and it is a rare person who achieves their goals without help along the way. Having an attitude of gratitude benefits the giver and the receiver. A good rule of thumb is to be remembered as the person described in the letters of recommendation written on your behalf. Keep in touch with former colleagues and mentors. You may need an encouraging word one day that can best come from someone who knows and cares for you. Your former faculty members navigated graduate training themselves and may be able to provide words of wisdom, support, or an outsider’s perspective during those times. In fact, there may be graduate school situations that are easier to discuss with someone who is not in the midst of them. A strong mentoring relationship does not have to end because of physical distance, especially in our technologically interconnected world. • Be open to links between your new and old schools. Graduate programs are seeking top students every year. You may be able to create a recruitment pipeline notifying your former department of graduate training opportunities and your new department of potential graduate students. 6. Do Not Let Your Hype Outpace Your Actual Performance. Any athlete who performs in front of others has critics. The bigger the audience, whether it be attracted by athlete popularity, pay, or self-promotion, the more vulnerable athletes are to harsh criticism. Sometimes this criticism reflects our human tendency to keep a close eye on those who are placed on a pedestal. Other times, it may be a sign that the athlete’s reputation has outpaced his or her performance. Incoming graduate students are in somewhat of the same boat. They have presented their body of work to the graduate admissions audience, and now they will be evaluated in light of what was promised. The successful student will be the one who lives up to their application packet and interviews. • You put effort into presenting yourself in the best light for your graduate school application. Continue to present yourself in an honest and positive light. Dress as a young professional. Be thoughtful in your communication. Be on time. Attend class with an emphasis on learning. Complete assigned tasks and gratefully accept additional responsibility when time allows. Express appreciation. Be the student who you would want to teach. • Have the courage to seek forthright feedback. Remember that you learn more from failure and weakness than from success. After victories, there is no need to think of better approaches. Instead, you can simply repeat the successful formula. After losses, however, you are forced to assess your performance more critically and think of new strategies. Thus, feedback and failure often lead to growth, while victory can lead to stagnation. At times, athletes might feel like the other team is playing with deflated balls, as if everyone else has advantages that they do not. This perception is dangerous because the mental game is as important as the physical game. Coaches know that a winning attitude is necessary to win. Staying optimistic and resilient are keys to success in winning the graduate school game as well. If graduate school was easy, more people would start and finish it. Just like in sports, only the tough make it to the finish line, and toughness reflects an underlying belief that the finish line can be crossed. Perhaps you have taken our earlier advice and submitted your work for presentation or publication only to have it declined, maybe even with some harsh feedback. Do not give up. Most psychology professionals have shared this experience. The difference between those with a lengthy publication record and those without is sometimes as simple as persistence. Take the feedback provided, revise, improve, and resubmit. Every round of feedback is a valuable tool to prepare for the next round of feedback. You might not have picked the correct outlet the first time, but you can do so the next time. Another possibility is that you were accepted to a graduate program but were not assigned to the mentor of your choosing. This disappointment may be a blessing in disguise. Your graduate program had more information than you do and used it when making their decisions. Your chosen mentor might not have had time or funding to devote to a new student, in which case it is in your best interest to be assigned elsewhere. The graduate faculty might have recognized a better personality fit between you and your assigned, versus preferred, mentor. Last but certainly not least, your interests may evolve as you progress through your training. The topic and lab that you had your heart set on during the application process may not ultimately be ideal for your later goals. Although you should enter graduate school with focus, you should also be open to growth and change that come from unexpected directions. If you were not offered funding through your graduate program, think broadly. Investigate the range of paid job opportunities on your graduate school campus. There may be graduate assistantships in other departments or through campus organizations such as residence life, where graduate students can earn a stipend while maintaining the flexibility needed to succeed in graduate school. Be creative and persistent as you explore the options. You will find it a great advantage to have a campus job versus taking out loans or seeking outside employment. Have a mindset to take advantage of opportunities as they arise, and do so with the awareness that you are preparing for a long-term future. For example, your graduate program may contact you and ask whether you are interested in teaching a class that frankly does not interest you. Instead of focusing on the class content, focus on the experience. The process of teaching may have far more worth than the cost of your disinterest. There will be tasks that you encounter in graduate school on which you fail partially or completely. After all, if you knew everything already, you would not need to be trained. See these challenges as a way to grow and be better prepared for future obstacles. For example, if you serve as a teaching assistant, you will be asked a question that you will not be able to immediately answer. You will have to decide whether you are going to bluster forward, without admitting your weakness, or use the event as a catalyst for self-improvement. When I teach, every time I am asked a question that I cannot answer, I find the answer and remind myself that it is the last time I will be unable to answer that question. The world of sports is obsessed with collecting performance statistics on everything and everyone from leagues to coaches to teams to players. As you move forward, remember that your statistics cover more than one game. You are not a snapshot statistic that was captured on your graduate school application. Instead, consider your ongoing body of work and stay consistently productive. The curriculum vitae that you started for your graduate school application does not stop during the interim between undergraduate and graduate school. In fact, your professional statistics will be built over a lifetime. As we have seen, getting into graduate school is your ticket to play at the next level. But, like the athlete, you have to keep playing even though the arena might change. Alvarez, L. D. (2013). My new school year resolution—Bringing projects to publication: Advice for faculty and students. Psi Chi Journal of Psychological Research, 18, 137–142. Burns, S. R. (2012). Relationship issues: Peers, faculty, and families. In P. J. Giordano, S. F. Davis, & C. A. Licht (Eds. ), Your graduate training in psychology: Effective strategies for success (pp. 33–39). Thousand Oaks, CA: Sage Publications. Koch, C. (2008). The value from the graduate school perspective. In R. L. Miller, R. F. Rycek, E. Balcetis, S. T. Barney, B. C. Beins, S. R. Burns, R. Smith, & M. E. Ware (Eds. ), Developing, promoting, and sustaining the undergraduate research experience in psychology (pp. 283–285). Washington DC: Society of the Teaching of Psychology. Ritzer, D. R., & Sleigh, M. J. (2004, January). Students’ perceptions of college as preparation for the job market. Poster session presented at the National Institute on the Teaching of Psychology, St. Pete’s Beach, FL. Merry Sleigh, PhD, is an associate professor at Winthrop University (SC) and Director of Undergraduate Research for the College of Arts and Sciences. She is in her second term as the Psi Chi Southeastern Regional Vice-President. Dr. Sleigh has won numerous awards for her mentoring, teaching, and advising. She is particularly passionate about helping students develop skills for future success through participation in undergraduate research. Darren Ritzer, PhD, is currently an associate professor of psychology at Winthrop University. He earned his undergrad degree in psychology from Lafayette College in Eason, PA and, he earned his PhD in industrial/organizational psychology from Virginia Tech. Before arriving at Winthrop University, Dr. Ritzer was a major in the U.S. Army.